The following are open source tools and examples that use DTrace, an implementation of dynamic tracing that is available in different OSes (Solaris, Mac OS X, FreeBSD, ...). DTrace helps troubleshoot problems on servers by providing new detailed views of application and system internals, to a level that was previously difficult or impossible to access. It provides a language to write DTrace scripts that is similar to C and awk and is event based. For a longer summary, see the wikipedia DTrace entry. This website contains many of my first DTrace scripts, written during 2004-5 on pre-release Solaris 10. These were developed into a collection called the DTraceToolkit, which contains newer versions of the scripts found here. My most recent collection was published in the DTrace book (Prentice Hall, 2011) pictured on the right, which contains many new scripts. Those new scripts can be found on the www.dtracebook.com website. DTrace is available for Mac OS X, FreeBSD, and the Solaris family of operating systems: Solaris 10, Oracle Solaris 11, SmartOS, OmniOS, and anything else based on the illumos kernel. Many of the DTrace scripts on this page were originally written for Solaris 10. Some will work on other operating systems with out changes, some will require minor tweaks to get running. As of Linux 4.9, the Linux kernel finally has similar raw capabilities as DTrace. This is the culmination of many tracing projects and technologies that were merged in the Linux kernel over the years, including: profiling and PMC events (perf_events), kernel static tracing (tracepoints), kernel dynamic tracing (kprobes), and user dynamic tracing (uprobes). The prior Linux tracers were ftrace and perf_events. The new Linux tracer, which builds upon all of these, is enhanced BPF with multiple front-ends available: in particular, bcc and bpftrace. See my posts about it: DTrace for Linux 2016 (eBPF) and DTrace for Linux 2018 (bpftrace). I also have a page on Linux eBPF Tracing. If you want a DTraceToolkit-like experience (canned tools), check out bcc. If you want a DTrace-like experience (D programming), check out bpftrace. I've published tools for both. For Linux tracing prior to eBPF, I wrote a collection of ftrace and perf_events tools, similar to the DTraceToolkit, that run on older Linux kernels: perf-tools, which I also talked about at LISA, Linux Performance Analysis: New Tools and Old Secrets. What about the add ons, like SystemTap, ktap, etc? Now that eBPF has been included in 4.9, all add ons should be looking at using eBPF for back end capabilities. That started in 2017 and will continue in 2019, as 4.9 kernels are rolled out and there's more demand for eBPF tools. To see some older material on these add on tracers, I did have a ktap page, and gave a talk in 2014, From DTrace To Linux. As for DTrace itself, there are two projects to port it to Linux: the dtrace4linux project, and, a different port for Oracle Linux. These ports do not appear to have momentum, whereas bcc/eBPF does. How does one get started with DTrace? You can use DTrace by just running scripts, or, you can write them yourself. Check out the DTrace OneLiners. See the DTrace scripts and one-liners in the DTrace book. Use scripts found in /usr/demo/dtrace, or in the DTrace Guide. Download Scripts from this website or Other websites. Search the DTrace mailing list for useful scripts, or elsewhere on the Internet. Some people will write their own customised DTrace scripts to troubleshoot faults or solve performance issues. Read Chapter 1 (at least) of the DTrace Guide. Read through the DTrace Examples. Study scripts. The best order would be kill.d, bitesize.d, sshkeysnoop.d, shellsnoop.d. See Other websites for scripts. Participate in the DTrace mailing list. Note: Many of the DTrace scripts on this site have been wrapped in the Bourne shell or Perl to provide command line options, allowing tools to be created for system administrators that are intuitive and easy to learn, by following the existing conventions and style of other Unix tools. See the DTraceToolkit website (and please update links to point to it). These are handy one liners to use at the command line. dtrace_oneliners.txt contains the full listing with examples. There are also many one-liners in the DTrace book, and as Appendix D of the Systems Performance book. The following demonstrates the operation of each of the programs with a link to download the code. (Note: to get the newest version of a particular script, also check the version in the DTraceToolkit). 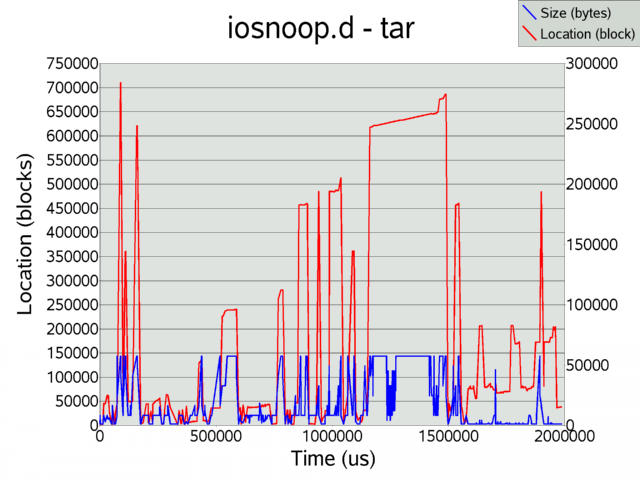 iosnoop is a program to snoop disk I/O activity. Here we can watch live what is happening on our disks, including the PID and command responsible. The output includes the block address and size of the disk operation - for the first time you can watch live what the disks are up to. Here a tar command was executed (tar cvf /dev/null /var) to archive a directory, while iosnoop captured the first 2 seconds of disk activity. Some scattered activity is observed while tar is reading through directories, and sequential transfers can be observed as tar encounters large files. More iosnoop examples contains more demonstrations and plots. Standalone iosnoop.d is a DTrace only version with examples here, and the old pre-io provider iosnoop.d is here. psio is another DTrace enabled disk I/O tool. iotop display top disk I/O events by process. This tracks disk I/O by process, and prints a summary report that is refreshed every interval. Full example. first release. check for updates. execsnoop is a program to snoop process activity. As processes are executed on the server their details are printed out. Another user was logged in running a few commands which can be seen below. This is especially useful in troubleshooting short lived processes that are otherwise hard to spot. More examples. Execsnoop has options to add the date and time (-v), or watch a particular command (-c command). Standalone execsnoop.d is the original DTrace only version. C version: execsnoop.c was written to compare the overheads between a libdtrace C consumer and a D script. opensnoop is a program to snoop file opens. The filename and file handle are traced along with some process details. More examples. Opensnoop has options to add the date and time (-v), or watch a particular filename (-f pathname). Standalone opensnoop.d is the original DTrace only version..
rwsnoop snoop read/write events. This is measuring reads and writes at the application level - syscalls. Full example. rwtop display top read/write bytes by process. rwtop prints a summary report that is refreshed at intervals. This is measuring reads and writes at the application level - syscalls. Full example. tcpsnoop snoop TCP network packets by process. This analyses TCP network packets and prints the responsible PID and UID, plus standard details such as IP address and port. This captures traffic of newly created TCP connections that were established while this program was running. It can help identify which processes is causing TCP traffic. Full example. new release. check for updates. Standalone tcpsnoop.d is a DTrace only version..
tcptop display top TCP network packets by process. This captures traffic of newly created TCP connections that were established while this program was running. It can help identify which processes is causing TCP traffic. Full example. first release. check for updates. udpsnoop.d snoop UDP network I/O by process. This analyses UCP network I/O and prints the responsible PID and UID, plus standard details such as IP address and port. This tracks UDP read/writes by payload. Full example. first release! check for updates. connections snoop inbound TCP connections as they are established, displaying the server process that accepted the connection. Full example is here. prustat This displays %CPU, %Mem, %Disk and %Net utilisation by process. To examine all four key performance areas by process in Solaris was prohibitivly difficult without DTrace. prustat also uses Perl, Kstat and the procfs structures from /proc/*/*. It is a new tool and still under development, released as a demonstration. Full example. dtruss This is a DTrace version of truss, designed to be less of a burden and safer than truss. In the below example, dtruss examines all processes named "bash" and prints out regular truss output plus elapsed and overhead times. See the full example. procsystime This program provides process system call details such as elapsed time from entry to return, overhead time for CPU time consumed, and counts. In the example below we examine "ssh" processes. Full example. hotuser Sample on-CPU user-level functions and libraries. This samples at 1000 Hertz, for a simple yet effective user-level profiling tool. The output will identify which function is on the CPU the most - which is the hottest. The following examples show hotuser analysing gunzip and gzip. Full example. hotkernel Sample on-CPU kernel-level functions and modules. This samples at 1000 Hertz, for a simple yet effective modules-level profiling tool. The output will identify which function is on the CPU the most - which is the hottest. The following examples show hotkernel analyse an x86 kernel. Full example. dapptrace This traces user and library function usage. This is similar to the "apptrace" command, however can fetch extra details such as function elapsed times and on-cpu times. Below is a demonstration of running dapptrace on the banner command, the user function calls are being traced. Full example. dappprof This profiles user and library function usage. This is a companion to dapptrace, where summary data is printed rather than a snoop of events. Below is a demonstration of running dappprof on the banner command. Full example. dvmstat This program provides vmstat like data for one particular PID, a process name, or when running a command. It prints statistics every second. Here we monitor a "find" processes, and can clearly see it exhaust the cache (dropping "re" reclaims), and then defer to disk (increasing "maj" major faults and "fpi" filesystem pageins). Full example. topsyscall This program continually prints a report of the top system calls, and refreshes the display every 1 second or as specified. Full example. shellsnoop captures the text input and output live from shells running on the system. In this example shellsnoop was run in one window, while in another several commands were run: date, cal and uname -a. (this is like a simple version of ttywatcher). Full example is here. Shellsnoop has options to view a particular PID only, and to only view data printed - which is somewhat spooky. Standalone shellsnoop.d is the original DTrace only version..
errinfo reports on system call failures with full errno details to help explain why these errors occured. It has two styles of output: a "snoop" style to watch events (the default), and a "count" style to provide a summary (-c). Both are demonstrated below, Full example. sshkeysnoop.d captures the keystrokes from ssh client commands running on the same server. Although the password is clearly visible, this is not a security problem with Solaris 10 rather a demonstration of the power of DTrace. Full example. shortlived.d This simple DTrace program measures how much time is consumed by short lived processes. This would normally be difficult to spot using sampling tools like prstat. In the example below, many short lived "expr" commands actually consume around 45% of the CPU. Full example here. cputimes print CPU time consumed by Kernel/Idle/Processes. The default output prints a breakdown of cpu time into three categories, Kernel time, Idle time and time consumed by processes; all in nanoseconds. Full example. cpudists print CPU time distributions by Kernel/Idle/Processes. The default output prints a cpu time usage by three categories, Kernel time, Idle time and process time. The value is the time in nanosecounds, and the count is the number of occurances. Full example. setuids.d snoop setuid calls. This can be used to watch user logins, and "su" usage. Full example is here. bitesize.d is a simple program to examine the way in which processes use the disks - are they causing large I/O operations or many small "bites"? In the example below we can see that the find command has caused mostly 1K events, while the tar command was transferring more data per operation. Full example. seeksize.d prints the disk head seek distance by process. This can identify whether processes are accessing the disks in a "random" or "sequential" manner. The example below illustrates sequential access. Use seeksize.d in conjunction with bitesize.d. Full example. zvmstat is a DTrace version of vmstat to print info per Zone. More examples here. zhostid is a DTrace daemon to change the host id to different values for each zone. More examples here. socketsnoop.d This program snoops socket data transfer events by process, identifying which process is responsible for reading or writing data on the network. Full example. anonprofile.d is a program to snoop anonymous memory usage by process. This provides a profile of a process's anonymous memory size over time. It can assist troubleshooting memory issues during software development. More examples here. intrtime Time spent by the kernel in interrupt threads was previously difficult to measure. intrtime gives a break down of the interrupt types and times spent servicing each. Full example. typewriter-0.75.tar.gz This makes your console keyboard sound like a mechanical keyboard. This is for entertainment only. typewriter.d running for the console keyboard. These are examples of performing troubleshooting using DTrace, and often begin by using DTrace at the command line before using DTrace scripts such as the tools above. DTrace vs truss this demonstrates the performace impact of using DTrace vs truss. DTrace is designed to minimise the burden on the system while it is running. DTracing SMC here we have a quick look at using DTrace to investigate the behaviour of SMC when it is first executed. SMC is a system administration GUI that takes a while the first time it is run as it compiles Java classes. DTracing Lost CPU here we take a look at a mysterious problem where the CPUs are busy, but there dosen't appear to be any processes responsible for this. Where has the CPU time gone? prstat vs top this analyses the CPU overhead of running prstat vs running top. In the past some people have suggested that top is a CPU hog - DTrace can measure it. Several years ago, Richard McDougall wrote taztool - a GUI to display disk activity in an amazing and intuitive way. It used TNF trace data - a predecessor of DTrace. DTraceTazTool is a DTrace version of taztool. It is currently in development, and as such this is an alpha release. There are many more features to code, but it may already prove a useful tool. The current version of DTraceTazTool is: DTaz-0.51. The thick red line is an indication of sequential disk activity, and the scattered blue blocks are an indication of random disk activity. DTraceTazTool needs to either run as root, or as a user with the dtrace_kernel privilege. dexplorer DExplorer automatically runs a collection of DTrace scripts to examine many areas of the system, and places the output in a meaningful directory structure that is tar'd and gzip'd. The following is an example of version 0.70. Full example. Output dir will be the current dir (/export/home/root/DTrace/Dexplorer). Sample interval is 5 seconds. Total run is > 100 seconds. The output file can be useful to send to other people for analysis. 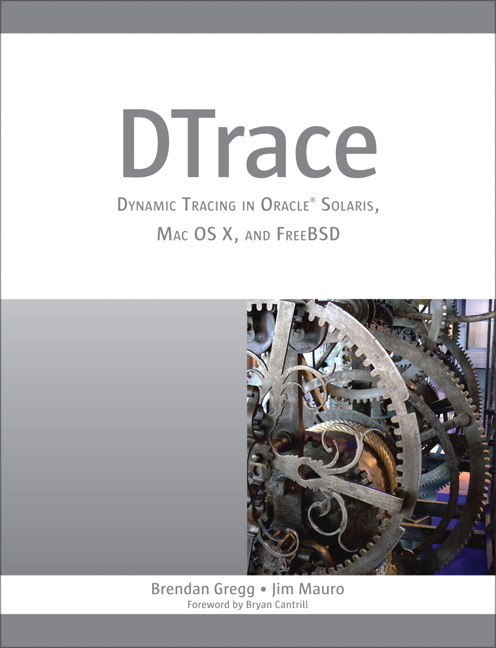 DTrace: Dynamic Tracing in Oracle Solaris, Mac OS X and FreeBSD - Brendan Gregg, Jim Mauro (Prentice Hall, 2011). Solaris Performance and Tools: DTrace and MDB Techniques for Solaris 10 and OpenSolaris - Richard McDougall, Jim Mauro, Brendan Gregg (Prentice Hall, 2006). DTrace book - scripts from the DTrace book. Solaris Internals - DTrace scripts by Richard McDougall. Brendan's blog - my professional blog (see dtrace tagged posts). The Wall - my personal blog, includes DTraceToolkit announcements. The Observation Deck - Bryan Cantrill's blog (DTrace Team). Adam Leventhal's Blog - (DTrace Team). $<blog - Mike Shapiro's blog (DTrace Team). Context-Switch DTrace - contains my workshop presentation slides. DTT Presentation - Stefan Parvu's DTrace and DTraceToolkit presentation. DTrace Community - (retired) OpenSolaris DTrace community website. BigAdmin DTrace - (retired) Sun's BigAdmin DTrace website.